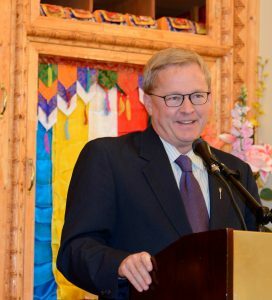 The Alberta Centre for Peace and Meditation provides access to traditional Tibetan Buddhist teachings along with retreats and several cultural events. Please know that your presence is welcome whether you are coming for a teaching or volunteering. The following information is offered as a way of contributing to your comfort and convenience when visiting. If you are planning a visit please see our Calendar to see the current scheduling of courses, events, and retreats, or contact our office to find out when the Centre will be open. Our Society is committed to providing an inclusive and welcoming environment for everyone – anyone with an interest in meditation or Buddhism, or both. We welcome people of all ages, cultures, spiritual backgrounds, abilities, gender expressions, and sexual orientations. Further to Kushok’s guidance, we welcome children to sit in the shrine room with their parent(s) so they may receive the benefit of hearing the teachings and seeing the sacred objects. Children are welcomed as they are the next generation who will carry on the practice and study. Out of respect for the teacher and fellow attendees we request the parent(s) to supervise and attend to the needs of their children. Please note we are unable to provide childcare. We welcome service animals inside the Centre however we do not allow personal pets on the grounds or inside the Centre. Our Centre was designed to accommodate those with mobility differences. We have a ramp leading to the main entrance. We have two accessible washrooms on the main floor and two accessible washrooms on the lower level. We have an elevator to provide access. Please do not hesitate to let us know what further steps we might take to enhance our accessibility. For your comfort and the wellness of everyone, please postpone your visit if you are experiencing a contagious illness, including cold and flu. We ask that our members andvisitors keep our Centre "scent free." We specifically ask that you refrain from using scented products such as perfumes and lotions as many of our members have allergies. As this is an environment where monastics and laypeople practise together, please wear clothing that is modest and tidy. You may wish to bring a shawl or scarf to cover your bare shoulders or legs. We ask people to refrain from wearing athletic clothing, revealing/tight fitting clothing, and tank tops. Casual comfortable clothing is appropriate for most events. During Buddhist teachings it is spiritually inappropriate to teach attendees who are wearing non-spiritually related head coverings (e.g. ball caps, hats, scarves). Please remove your head covering upon entering the Centre or any other Buddhist centre. You may wish to bring a pair of slippers or thick socks and as we remove our shoes upon entering the Centre. Shoes are removed at the front door and carried down to the lower level to the designated shoe shelf. Jackets and backpacks may be left downstairs at the coat rack. You are welcome to bring your valuables (e.g. purse) into the shine room as all belongings on the lower level are left unattended. Please note we are not responsible for personal belonging brought to the Centre. You are encouraged to turn your electronic devices to silent (or off if you can) upon entering the Centre. If you are attending a scheduled event, there is often someone at the door to greet you. These volunteers are typically senior members of our Society and may be able to answer your questions or direct you accordingly. There are many painted cloth scrolls (Tibetan. thangka) depicting various deities in the Tibetan Buddhist pantheon. At the front of the room is a wooden altar carved by a local Tibetan artisan, encasing statues of Buddha and the Bodhisattvas Tara and Chenrezig. A variety of items are offered on the altar, including water bowls, butter lamps and candles, food, and flowers. On the Buddha’s left, there is a Tibetan sand painting, an ancient art form. "Mandala" is a Sanskrit word meaning “world in harmony”. Mandalas are drawings in three-dimensional forms of sand. Visitors are always welcome to bring items to offer on the altar such as flowers, fruit, beverages, or other healthy food. We have an on-site library with access to over 1,000 reference items available to members of the Society an visitors. Lotus Members of the Society and visitors are invited to browse through resources on-site. Jewel and Vajra Members of the Society are eligible to sign out library materials for a period of 1 month. We have a small, yet remarkably robust, selection of books and other resources to support your practice, along with other materials such as calendars, postcards, and bookmarks are available for purchase. Hand-selected Dharma Store items are often available at our off-site retreats (such as the Providence Renewal Centre) and events (such as the annual Tibetan Bazaar). Purchases can be made with cash or credit card (no ATM on site). We have a kitchen and dining hall on the lower level that creates opportunities for us to host visitors. We share meals together on some Tuesday evenings before class and some Sunday lunchtimes after the meditation. Please call before you come to inquire whether a meal is being served that day. Having meals together in our dining room is an opportunity for you to experience part of the joy of belonging to a community. Meals are prepared by Society members and volunteers. Our kitchen meets Alberta Health Services standards and is inspected regularly. After incense has been lit, our teacher will perform his prostrations, during which attendees stand respectfully. Once the teacher is seated some attendees perform their own prostrations. If you are new, you may join in or stand quietly. When prostrations are completed everyone may be seated. For those wishing to participate, please click on the Meaning of Prostrations for the appropriate mantra and mindset. After everyone is seated, the teacher will lead attendees through the opening meditation and prayers, which are found in the Prayer Book handed out to everyone. Attendees may join aloud in the prayers and practices, or contemplate silently. We have seating (both chairs and meditation cushions) available and you do not need to bring your own cushion. If you are interested in purchasing a Prayer Book for practice at home please see the office. Depending on the session, the type of meditation and teaching will vary. Introductory classes place an emphasis on secular meditations, such as breathing meditation and calm abiding meditation, to settle the mind and body, and bring focus to the mind. Attendees may also choose to do a visualization of the Buddha or the practice of tong len (the practice of understanding others' suffering and sending out compassion). Other teachings and meditation practices delve more deeply into other forms of meditation, including analytical and deity yoga. Sessions close with a prayer to dedicate, or "lock in" the merit of spending this period of time improving one's mind. We dedicate that any insights we may have gained not only benefits ourselves, but all others, and that we can be of continued and long-lasting benefit to others. Attendees are encouraged to ask questions about the teachings or practices at the end of the session. If you wish to receive advice on a private or personal matter with our Spiritual Director please schedule an appointment with the office at info@gsl-ab.ca. It is a good practice to make a small offering if asking for advice. 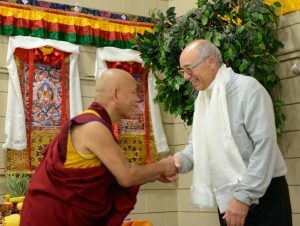 Generosity is an important part of the Buddhist teachings. You may wish to make offerings to our teacher. These are often made at the end of the teaching (after the dedication). You may wish to make offerings to the Centre to help with building upkeep and the running of the Centre. The donation box is located inside the entrance of the Centre. We encourage everyone to speak and act mindfully. Please close doors quietly and be aware of your talking, laughing and actions and their effect on others. We conscientiously keep the Centre and grounds as neat and tidy as possible. If something is broken or untidy, please do not hesitate to tell a senior member of the Society or notify the office by email at info@gsl-ab.ca. We act mindfully of our resources; for example, please turn lights and fans off when not in use. Check to make sure you have all your personal belongings with you. Personal belongings left behind are held for a maximum of 30 days and then donated to charity or discarded depending on the item and its condition. Rejoice in your meditation practice and all you gained by visiting the Centre. Rejoice in any volunteer service offered by yourself or others.